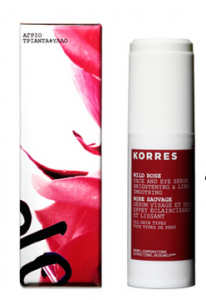 After years of searching, I have finally stumbled upon an eye and face serum that actually works– reducing the puffiness and darkness on the skin under my eyes and dryness along my face– all thanks to the creators of Korres Wild Rose Face and Eye Serum. With a sleek, compact, and pretty packaging, this serum is part of a larger skincare repair line aimed at not only brightening, smoothing and lifting the skin, but also preventing the number, depth, and length of wrinkles and age lines along the face, especially under the eyes. With an array of ultra-concentrated ingredients, such as active agents made from wheat proteins, it gives the skin multiple properties and vitamins essential for natural and healthy skin repair and maintenance. Formulated with wild rose oil– which gives the serum a light and refreshing scent– it’s a perfect face primer before makeup application. The vitamin C, used to boost skin brightness and radiance, continues to work all throughout the day, even working with liquid foundation and powder makeup. This product, clinically proven to reduce the intensity and growth of wrinkles, completely satisfies all of my needs and desires. From someone with intensely dry and consequently itchy skin, this serum seeps down into my pores to moisturize and soothe my skin. Bcause of the enriching ingredients, none of my pores have ever been clogged and my face has not reacted badly at all. Also, this product kills two birds with one stone. It maintains my skin and deathly looking under eye-bags, as well as prevents them from getting darker and creating wrinkles. On top of that, I much prefer this packaging over a pot, which can get fairly unsanitary after some use, or squeeze bottle, which can leak or explode, as the pump on the Korres Wilde Rose Face and Eye Serum allows me to limit how much product I want to use. Additionally, the cap closes snugly onto the body of packaging making sure the pump is not pressed or broken while I travel. A few things to take note of for this product. If you are one to be rushing around in the morning with little to no time to get ready, this product is not for you. Because this product contains so many rich and concentrated ingredients, it takes some time for it to completely seep into your pores. Personally, right after application, the skin right under my eyes look a little oily and shiny. So, what I usually do is blow-dry my hair for about 5-7 minutes, which allows the serum to completely soak into my skin. Also, as mentioned earlier, this serum contains wild rose oil. For me, other than during the actual application of the product, the smell is almost undetectable, but if your nose is extremely sensitive or you want a product with no scent at all, I would suggest another eye and face serum like one from Origins. Basically, this is a good everyday face and eye serum. Designed for all ages and skin repair needs, it heals and protects almost every problem a person could have on the face and eye area. Though a tad bit pricey, the serum goes a long way lasting for a significant amount of time.